The series of natural disasters we’ve seen the past two months is like nothing I can recall. Hurricanes Harvey, Irma and Maria destroyed or damaged hundreds of communities, particularly in Puerto Rico, Florida and Texas. The devastation in each of these communities continues to affect many, many people. And that includes Club staff people, their families and the kids they serve. 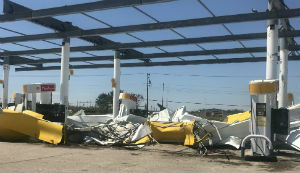 A BGCA volunteer snapped this photo of a storm-mangled gas station outside Houston. We responded quickly, doing everything we could to get Clubs back up and running, including providing volunteers and supplies. Probably the most important thing we’ve done is raise money for them. Like any organization, Clubs need a lot of money to recover from these climatic events and continue providing services and a sense of normalcy to kids who need us most. We reached out to partners and supporters, asked them to help repair and rebuild damaged facilities and aid the recovery of our Club members and staff. And they stepped up, donating millions in cash and in-kind donations to recovery efforts. Deerbrook Charitable Trust donated $1 million. Toyota donated 29 vehicles to affected Clubs in the Houston area. Many more – including Build-A-Bear Workshop, Charles Schwab, Choice Hotels, Finish Line Youth Foundation, Lenovo and Old Navy – answered the call, too. So did many of our national trustees and board members. BGCA is tremendously grateful for these generous contributions that have allowed Clubs to reopen and serve their communities. 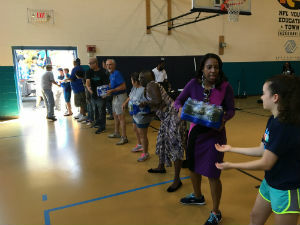 Volunteers unload relief supplies at Jacksonville Club. Club recovery efforts continue to progress in Texas, Florida, Puerto Rico and other areas. Most mainland Clubs have reopened and are once again serving youth. In Puerto Rico, Club staff are providing programming around the island, though several sites continue to serve as makeshift hospitals and health centers. And NFL All-Pro player Josh Norman and his Starz24 Foundation launched a campaign to raise $250,000 for Clubs in Puerto Rico. Recovering and rebuilding from a natural disaster is a long-term endeavor. Our deepest thanks go out to everyone who is helping our affected Clubs to prepare for this journey.